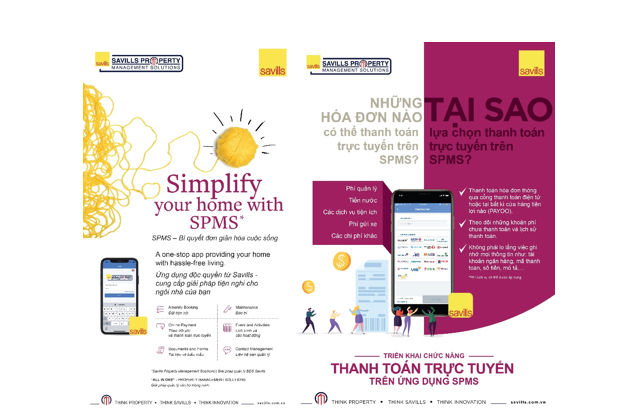 Savills Vietnam has developed its Savills Property Management Solution Software (SPMS), an exclusive communication channel that connects the Savills property management team and building residents. The new software is expected to set a new standard in property management and address the needs of residents, ensuring the integrated operation of the building. The mobile app offers an immediate and personalized response to requests and demands via an automated system. Providing a clear passage of communication between residents and property managers, SPMS also enables residents to process bills and book building amenities with a few simple clicks. Savills Vietnam has utilized technological advances and new consumer attitudes in order to create this bespoke software solution. The SPMS will provide residents with features including placing Work Orders, Visitor Registrations, Online Applications for services such as additional parking spaces and registering new residents in the household, Amenities’ Booking, an Events Calendar, Online Payments (deposits and invoices) for electricity and water, etc., and a folder of documents and notifications from the management board. Features for the Management Team, Board of Committee, and the Developer includes Resident and Unit Profiles, Work Orders (to staff), Fee Notifications, Staff Management, Resident Feedback Management, Online Reports, and Partner Information and Communication. The SPMS has been integrated into projects managed by Savills Vietnam in Ho Chi Minh City, Hanoi, and Da Nang. The application will be updated regularly with new features to make all operational process more convenient and streamlined. Savills Vietnam is one of the leading property management practices in Vietnam with more than 70 developments in its portfolio at Hanoi, Ho Chi Minh City, and Da Nang. As at February 2019, Savills Vietnam’s management portfolio had reached over 6.3 million sq m, including major developments such as StarLake, Mandarin Garden, Saigon Pearl, the Vista, Avalon, Riviera Point, and Masteri Thao Dien.